Membership in Phi Lambda Sigma consists of four categories: Students, Faculty, Alumni, & Honorary. Selection for membership comes from the existing members of the society. Prospective members are nominated on the basis of their demonstration of dedication, service, & leadership in the advancement of pharmacy. Members are selected by peer recognition. Such recognition serves to instill self-confidence & to promote greater efforts toward the advancement of pharmacy. 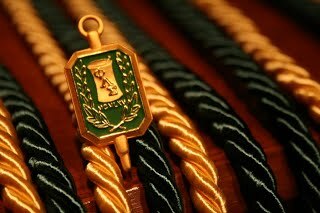 Because Phi Lambda Sigma is an Honor Society, its members are individually recognized at graduation, and wear honor cords on their graduation gowns. Membership in Phi Lambda Sigma is life-long. Application for the 2018-2019 term is CLOSED. A minimum GPA of 2.50 in the pharmacy curriculum, to be verified by the PLS faculty advisors. Completion of at least three semesters of the professional program. Current membership in at least one national pharmacy organization, including: AMCP, APhA-ASP, CPFI, IPhO, NCPA, SCCP, SNPhA, & SSHP. Completion of the PLS application (below). Letter of recommendation from a faculty member or professional in the community. cords. Please note the membership dues are a one time fee. Payment is due at time of induction.